Over the past few weeks have seen a push to beautify our HS/MS cafeteria. Perhaps it was those big, empty walls. Perhaps it was the lack of color. Perhaps it was that gnawing feeling that a statement needed to be made. 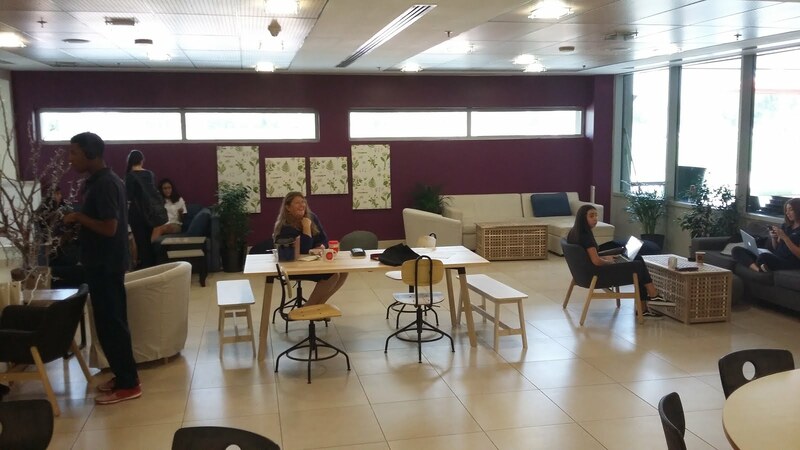 Whatever the reason, students participating in Environmental Science informed action projects and Sustain Our World, quite independently, decided to focus on "greening" and beautifying the space and to make it a more inviting area. It was a two in one deal, quite fortuitously. The one that took shape first was an initiative by Sustain Our World. Wanting to make the cafeteria experience a bit more "user friendly" and natural feel, initiated a re-design of the Grab & Go area. For those who visit the space now they will see a newly painted space, indoor plants adorning the surrounding spaces, nice new and inviting furniture and a few sound boards made by the students themselves. The place looks great! We asked some middle school students to give the space a name, and they decided that "Cozy Corner" might work, or something with "cafe" in it. It's indicative of the "feel" of the space now. 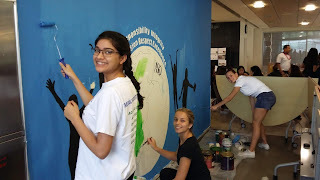 Just on the other side of the Grab & Go (or Cozy Corner Cafe) area, facing the larger cafeteria space, a group of HS students are creating a sustainability themed mural! As a community project that began in Ms. Noll's Environmental Science class, the mural was the result of the collective work of a number of students who, over time, have participated in its painting. The new mural will be "good to go" soon and will highlight ASD's developing critical consciousness with regard to the environment and our collective impact specific to sustainable behaviors. Well done to our super ASD community builders! Below you'll find a fun video of a short time-lapsed portion of the work being done on the mural. Take a look!